Our new CollectPlus tracking page is live – check it out. One of the best things about using CollectPlus to collect or return online shopping is the ability to track your parcel all the way to its destination – so you’re kept up to speed on when you’ll get your new outfit, or a refund for one that didn’t quite fit the bill. We wanted to give you a quick heads-up on our new, improved tracking page which will make it easier than ever to stay on top of your orders. CollectPlus tracking – what’s changed? Ever hit ‘delete’ on one of our text messages by accident, or lose that all-important email with your collection code inside? Based on your feedback, we’ve now developed a secure way to access this code online, helping you to avoid being in the frustrating position of being unable to collect your items. To make use of this service, all you need to do is create an account with us and next time you track a click & collect order you’ve placed, you’ll be able to access the collection code for any items that have recently arrived in one of our stores. Just click on the grey button marked ‘collection code’ to the right of the parcel you want to collect – you can see this new option next to the John Lewis parcel in the example above. We’ve made it easier to check your parcel’s current status at a glance, so you can quickly find out where it’s at in the delivery process. 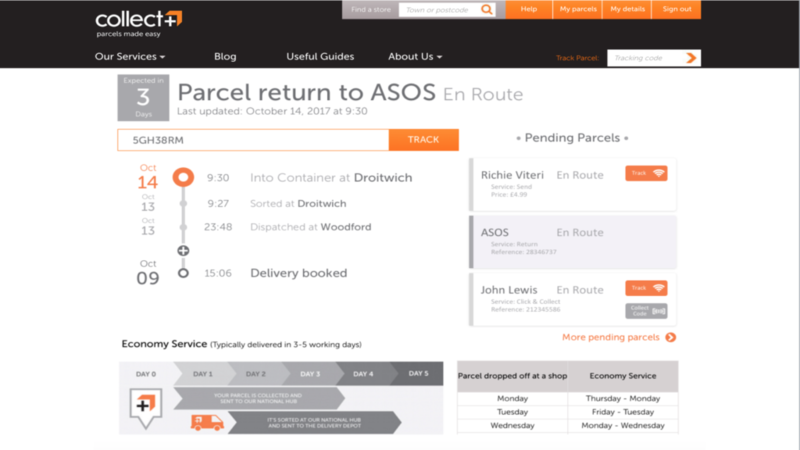 For example in the screenshot above, the returns parcel is en route back to ASOS. This summary will change as your parcel moves through our network. When you’re eagerly awaiting an online shopping order, we know you want as much information on your parcel’s arrival as possible. That’s why we’ve added an ‘estimated delivery date’, which you can now see on the top left hand corner of the tracking page (see example above). This feature also works for returns and parcels sent through our Send service. Think you might want access to this info at a later date? If you create an account with us you’ll be able to see your full order history, as well as tracking information on any parcels that are currently on their way to or from a retailer. Take a look at our new tracking page here.